After a scoreless first half at the PHC Stadium between the PHC Zebras and the Devonshire Cougars, Marco Warren gave the PHC Zebras the lead in the 56th minute when his low shot went in off the upright. Zari Simmons equalized for the Devonshire Cougars with a goal in the 72nd minute. Kushae Hypolite would score the winner for the PHC Zebras in injury time. 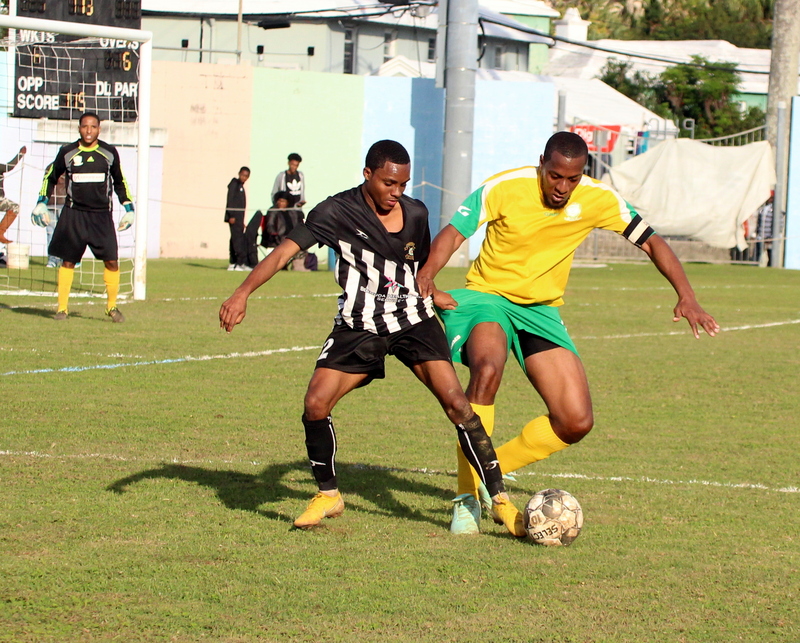 The Dandy Town Hornets left it to the end, but they came from behind to defeat the Paget Lions 3 – 2. Kwame Steede gave the Dandy Town Hornets the lead in the 3rd minute, but Dion Stovell equalized for the Paget Lions in the 42nd minute, Stovell would score his second of the game in the 63rd minute to give the Paget Lions the lead. The Dandy Town Hornets would draw level in the 87th minute through Angelo Simmons and then two minutes later Simmons would score the winner. The Boulevard Blazers and BAA went to battle at Lords in St. David’s. BAA would pick up the win coming out on top 4 – 1. BAA would get lone strikes from Nathan Rego, Keishen Bean, Jibri Salaam and Troy Tucker, with Boulevard Blazers player coach Ian Coke finding the back of the net for the home team. At the Garrison Field, X-Road’s and the North Village Rams played to a 1 – 1 draw. Marcellos Thomas gave the North Village Rams the lead in the 25th minute, with Teiko Lowe equalizing for X-Road’s in the 47th minute. The Southampton Rangers remained undefeated in the First Division following their 1 – 0 win over Hamilton Parish at the Southampton Oval. The lone goal came in the 19th minute with Jarazinho Bassett scoring. At the White Hill Field the Somerset Eagles came from behind to defeat the St. George’s Colts 2 – 1. The St. George’s Colts would take the lead in the 21st minute when Micah Mendes scored, but the Somerset Eagles would equalize in the 69th minute when Tahj Wade scored. Leo Burgess would then score the winner for the Somerset Eagles in the 75th minute. At the Police Field, Devonshire Colts would defeat a 10-men Wolves team 4 – 2, Wolves had player/coach Vincent minors sent off in the first half, Devonshire Colts were led by Chermal Henry who scored a hat-trick, with Daniel Ball adding the other, while Wolves got a goal from Hopde Burrows and Lamelle Paynter. Vasco would go down 8 – 0 to the Flanagan’s Onions in their match at the Bernard Park, Treshun Smith would lead the Flanagan’s Onions to victory with 4 goals, while Mikale Williams, Paul Smith, Jah-von Morgan and Daniel Alhner all added a goal each.